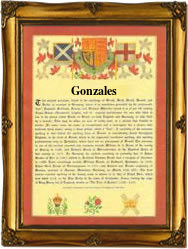 This famous surname recorded in the spellings of Gonzales, Gonzalez, Gonzalvo, Gozalo, Gonzalvez, Gosalvez, Goncaves, and Gonzalo, is usually accepted as being of Spanish or Portuguese origin. However in truth like so many Iberian surnames, its origins are Germanic. In the 5th century the Visigoths from Eastern Germany conquered the whole region, sweeping down from the Baltic and across the Pyrenean mountains into the Spanish Peninsula. Their legacy today is often found in the surnames, and these surnames themselves have crossed the ocean to the American continent. In this case the development is from the early German baptismal name 'Gundisalvus', which loosely translates as 'the battle field or battle place', a typical example of a warlike name so popular in the period. Examples of the surname recordings taken from early church registers include Maria Gonzales who married Alonzo Moreno at Villapalcio, San Sebastian, Spain, on October 3rd 1568, and Catharina Martin Gonzalo, christened at Agusal, Valladolid, Spain, on May 7th 1618. An early recording in Mexico was Francisco Goncalo, at Puebla de Zaragoza, Puebla, on June 12th 1590. The coat of arms most associated with the name is probably that granted to Gonzales de Castille, which has the blazon of a triple towered castle on a red field. The first recorded spelling of the family name is shown to be that of Marcos Gonzales de Junguito, which was dated July 1st 1556, christened at Segovia, Spain, during the reign of King Philip 11 of Spain, 1554 - 1590. Surnames became necessary when governments introduced personal taxation. In England this was known as Poll Tax. Throughout the centuries, surnames in every country have continued to "develop" often leading to astonishing variants of the original spelling.